Island fun and tropical sun! Sara is back in an exotic new adventure! Help Sara and her friend, Coco, to harvest produce, such as pomegranates and pineapples, while tending adorable animals, from llamas to peacocks. Travel to the ocean for some exciting fishing, and collect gold coins to help decorate your farm. Will spunky upgrades be enough to help Sara successfully launch her new tropical farming division, or will she be defeated by a diabolical menace, who challenges her at every turn? 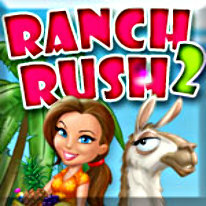 Find out in the highly anticipated sequel, Ranch Rush 2.